I don't know that I ever told you before, but I love all things nautical. I always have. I've always been drawn towards anything nautical. I like to joke and say it's because my father was a sailor. He was in the US Navy. Dad always knew of my love for all things nautical, so whenever he would chance upon a piece treasure from his days in the Navy, he would give it to me. I have his old uniform, his lighter, a framed photo of his ship, his medals and his ribbon pins. I can still remember spotting these salad plates in Home Goods. It was love at first nautical sight! 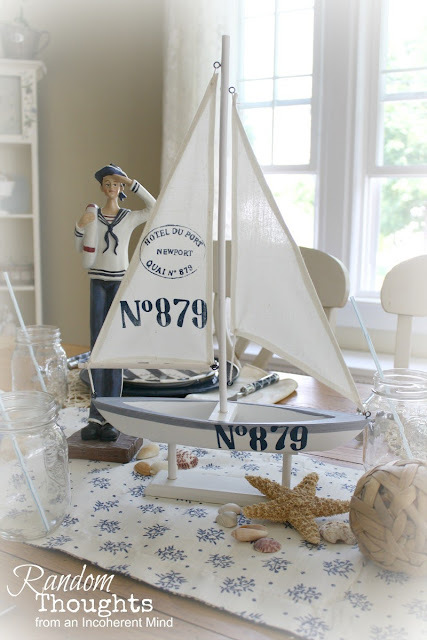 I gathered some nautical and coastal goodies for my centerpiece. Thank you for taking a look at my tablescape. As always, I appreciate your visit! Hi Gina, could you please duplicate the same table scape for my home, I absolutely love it! Gina, you table is adorable!! What a great story, about your dad being in the Navy and all of the treasures of his that you have. Your plates and flatware are wonderful and that centerpiece is soooo cute! Love this!!! Gina, this is so pretty! I love nautical decor too. I cannot believe that someone else besides me and my bff wore a sailor suit in high-school. Mine was a one piece -white pants, sleeveless striped navy and white top with a red tie thing at the neck. So dorky! But we thought we were something! Funny stuff! I love your themed table, Gina! Don't you just love salad plates? Those that you spotted from Homegoods look so great on top of the navy blue dinner plates. Your accessories go perfectly with your cute nautical theme. I am envious of those nautical salad plates, those are cute cute cute!! The flatware is a perfect pair for the plates. When you saw this boat - did you flip? - because it is the perfect centerpiece along with the sailor!!! all say it again - cute cute cute!!! Gina, what a cute table, how great to have all of your Dads Navy treasures,I know you are so proud of him and I bet he loves that you love it! I love this a billion times over!!! Those plates are some of the best-looking ones I've seen that depict a nautical theme. They're not too over-the-top, though, and that's what I like about them. The stripes in them convey the message without going crazy. They're gorgeous!!! I love the boat, too! What a cute, cute centerpiece! It looks great on that runner and with all the other accessories gracing the table...especially the sailor! SO cute! I am sending you a photo of me that I think you will have a good laugh at. We can commiserate about our sailor suits! :-) Have a really good weekend, and take care! Love the nautical. It is all in again. My 12 yr old is all about nautical right now too. She loves it. I think she just loves anything that has to do with the beach. Looks like a little sun there in the window...I'm so tired of summer rain here too! I love this table! It is so fresh, bright and fun! 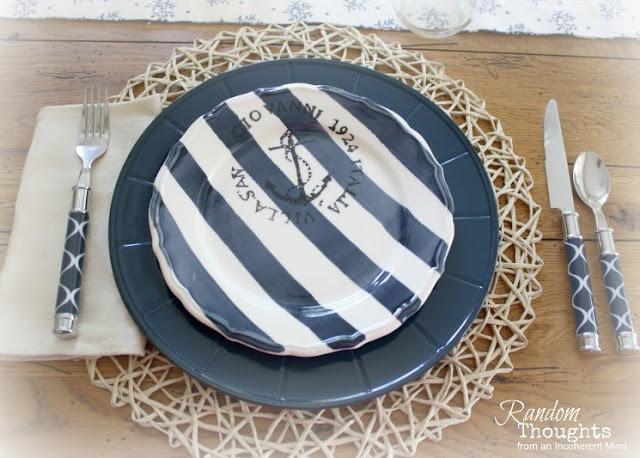 The striped plates would have stopped me in my tracks too, and the sailor boy just makes the whole thing! Pinning so I can remember all your cute touches! 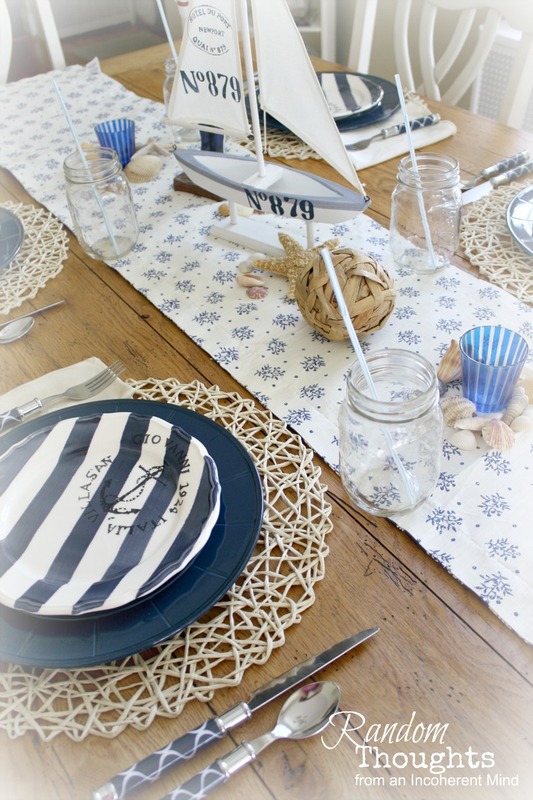 Who wouldn't love this blue & white nautical theme? It's so crisp and perfect for summertime! I bet it looks so nice with the rest of your home's color scheme too! Enjoy your table scape and all the memories it brings! That is darling Gina! Love the little boat! My stepsister and I had a nautical outfit that we shared during the 80's. It was a blue and white striped skirt and a little white sweater with anchor buttons:) We later turned the skirt into a mini skirt...va va voom! What a great table for anyone that loves the water! Fabulous centerpiece. I can almost smell the sea air! You captured the nautical theme perfectly, Gina. you always amaze me with how you put things together so beautifully. Thanks for sharing! I hope you'll link it up at our All Things Thursday Blog Hop this week! 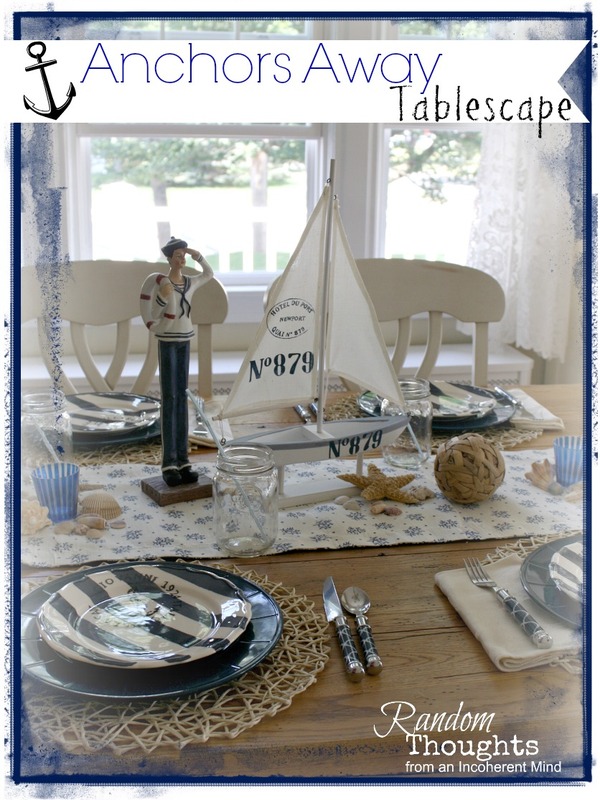 I LOVE your nautical tablescape, especially the dishes and the sailor boy! My husband is in the Navy, and I too, have a love for all things nautical. Thanks for sharing! From one nautical fan to another, this is fabulous! I love your salad plates as well. Your whole setting makes me want to go out and sail! Love it! This is awesome. Sweet and Welcoming. 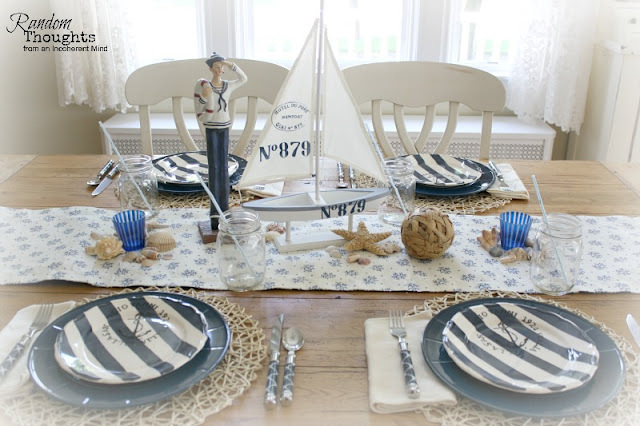 Your nautical table is just adorable. Makes me want to see the ocean!! Would you give me your address so I can sneak in and steal those darling dishes while you are on vacation. Obviously I am kidding, but those are just so stinkin' cute. I absolutely love this tablescape, and the salad plates are my have! How cute! Thanks for sharing your dad's story, too. I appreciate his service to our country! I need to find some of the elements on your table because Shelley just made an equestrian team and her team colors are nave, white, and red! I love the nautical look! !